The Galapagos is not a turtle, it is a tortoise. Galapagos Tortoises are the largest tortoise species in the world and the 14th heaviest living reptile. They were first spotted in the Galapagos Islands in 1535. The islands were named after these tortoises. Galapago which means 'saddle’ in Spanish refers to the tortoise’s saddle-shaped shell. Growing over 6 feet tall in length and weighing roughly 500 pounds, these huge vertebrates have an impressive life span. The average lifespan is over 100 years with the oldest Galapagos tortoise said to have lived for 152 years. The tortoise has a very high shell that is brown and light green in color. This blends well with their surrounds. 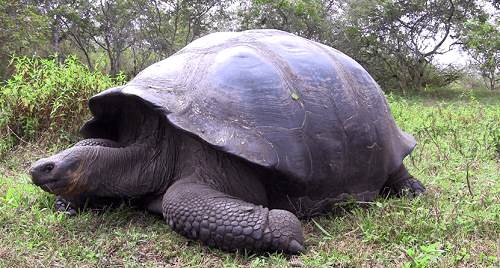 Where is the Galapagos Tortoise found? The Galapagos is the home of this tortoise. They tend to migrate seasonally from low elevations so that they are on the grassy plains when it’s dry and then in the higher elevations when it’s wet. Having been reduced to near extinction, only 11 out of the 15 tortoise subspecies exist in the Galapagos today. The tortoises were hunted as food by pirates, merchantmen and whalers during the 17th, 18th and 19th century. More than 100,000 tortoises have died and today, only about 15,000 remain. Five of the 11 subspecies can be found in Isla Isabela, while the rest can be found on the islands on Pinzon, Espanola, Pinta, Santiago, San Cristobal and Santa Cruz. The Galapagos tortoise are herbivores, they feed on fruits, cacti, vegetables and grasses. They are able to store water and food in their bodies letting them live up to a year before they can eat and drink again. They are mostly found in elevated areas where the humidity is higher and there are grassy fields. However, some subspecies of this tortoise also live on dry islands where the grass is sparse. These cold-blooded reptiles are playful in nature and spend most of their day basking in the sun. At night, they rest half submerged in their mud or water to stay warm. Many may get the impression that this is a lazy creature because they can nap for up to 16 hours day. These animals are poor swimmers. Galapagos tortoises can reach maturity at the age of about 20-25 years for those breeding in zoos, and 30-40 years for those in the wild. When they reach maturity, they begin to mate. Their breeding seasons can last for a long time, from January to August. There is an interesting thing about their method of looking for a mate. The males face each other, open their mouths, and stretch their heads to the sky as high as they can. The winner will gain the female. After mating, the female goes to a nesting area several miles away to find a proper place to lay her eggs. This place needs to be dry and sandy, so that she can bury the eggs. On finding the right spot, she will take a long time to dig a hole about 12 inches deep. The eggs are covered with sand. After this, she will make a mud plug mixed with urine to seal the nest hole. After completing all her work, she will leave the eggs to be incubated by the warm sun. Unlike many animals, the gender of these tortoises can be determined by temperature. If the temperature is low, more males are expected and if it’s high, more females will be. Gestation can range from 4-8 months. The baby is very tiny, weighing about 50 grams and measuring 6 centimeters. After the young tortoise breaks out of its shell, this little creature must dig its way up to the surface. This process can take almost a month. After this, it’s totally up to the tortoise to survive in the outside world. In most cases, during the first 10-15 years, they will stay in the warmer lowland area to practice themselves to fit the surroundings. Several years, when they reach maturity, they can breed their own offspring as well.